Well, you have no reason to be embarrassed at all! The fire itself curiously gives me a ‘cold’ quality (which is not bad! 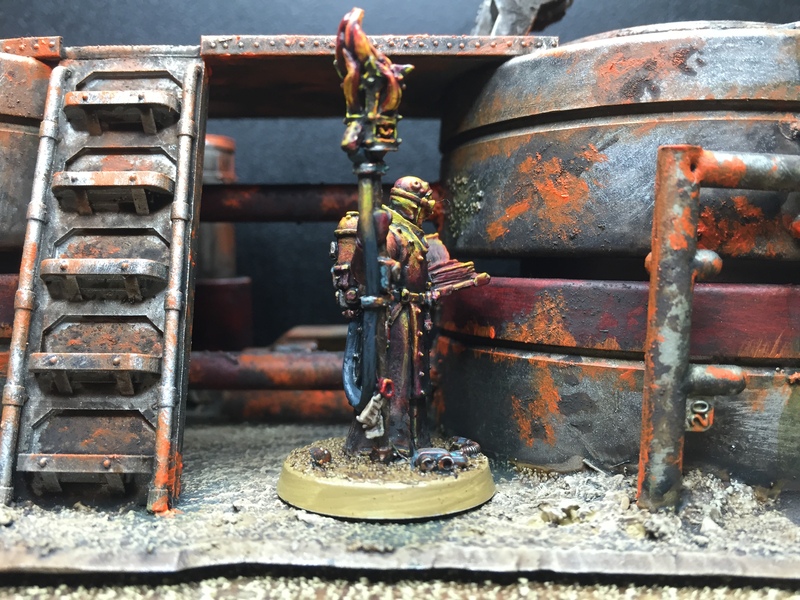 ), and the OSL looks damn nice! Thanks Suber, appreciate that mate, not bad for a first attempt ;-) I may make the fire a little brighter tbh – the osl is brighter in places than the flames… a bit more tweaking over the weekend I think. 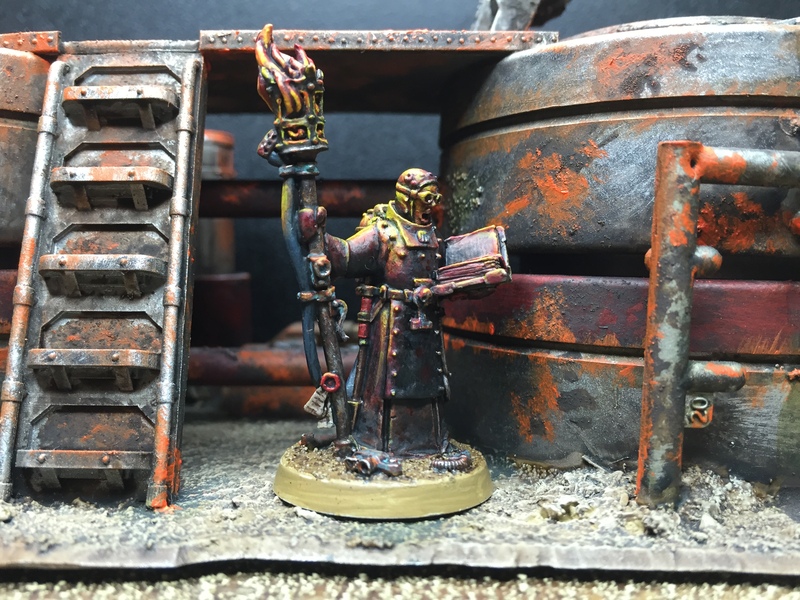 Cracking stuff mate (and I’m speaking as someone who doesn’t like sculpted flame on models at all – which of course has nothing to do with a deep-seated fear of painting OSL… honest…). 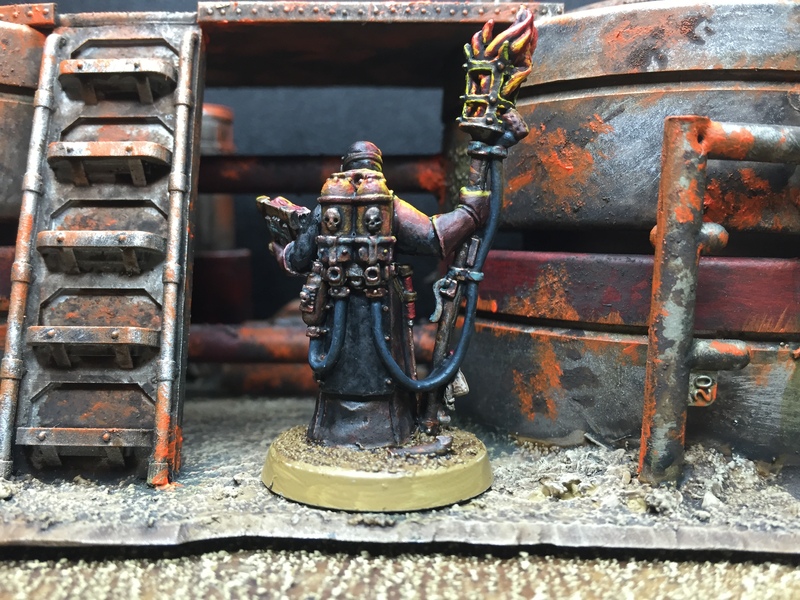 I agree with Suber that the flame actually makes the model look cold – which is only as it should be, its lends the acolyte a feeling of walking through some chilly dungeon with his torch. Agreed, NMM freaks me out a bit as well. When it comes to modelling/converting I think I’ve beaten that part of my brain into submission (I think greenstuff is its last bastion but I’m leading an all out assault on that at the moment) but when it comes to painting the challenge can be much harder. As you say there’s not a lot to loose – if it works then great, if it doesn’t then strip it and start over. 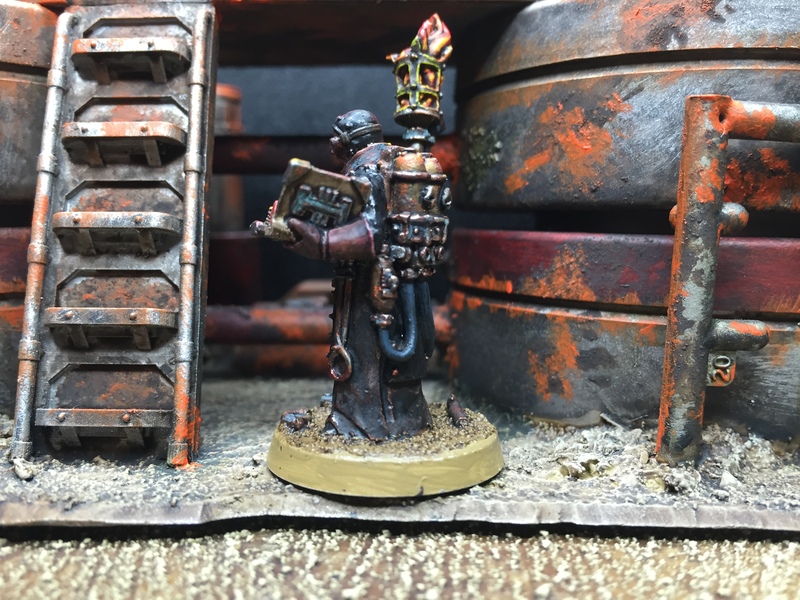 But if you mess up a conversion you can have turned a (possibly rare or expensive) model into a pile of scrappy off-cuts with next to nothing you can do about it. I still find that latter much easier than the former though! 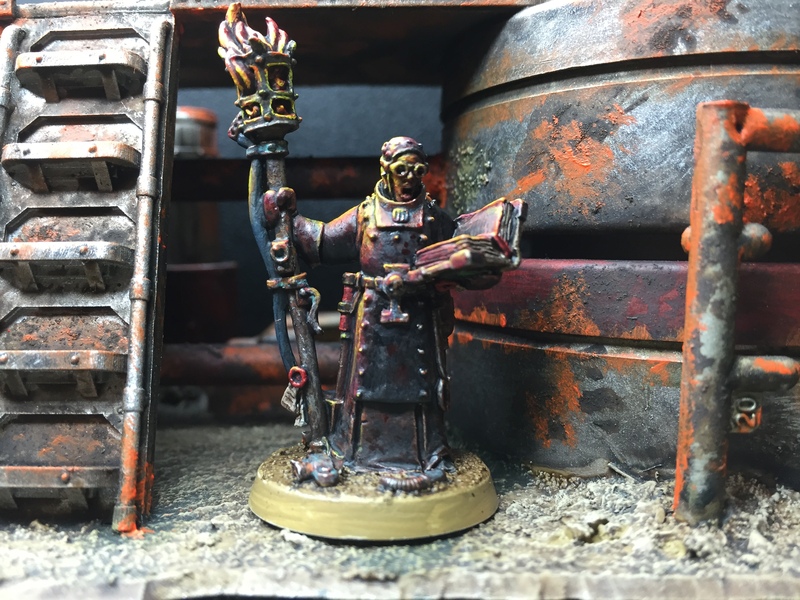 I’ve got to say I’m not a fan of open flame on models, I’ve never seen it painted and looking cool… Until now my friend. I like that you haven’t gone to bright with it or too orange. Looks really cool and the acolyte himself looks like he’s been loping through some of the darkest and grimmest hidden corridors in the galaxy. I really like him. What’s this NMM you blokes are referring to? I am elderly and a Noob. I stumble along in the darkness and you guys need to be my lights of wisdom and knowledge haha. Aw, thanks mate – much appreciated! I’m a cautious fan myself, it can look really good. NMM is ‘non-metalic metals’… using basic flat colours to give the appearence of metalics… one of the most advanced tecniques I believe, and not one that I am in a hurry to try! Wow haha. I’m way off even thinking of attempting that. So is this Acolyte going to be apart of a crew? yeah, me too dude :-) I don’t know if he’ll be part of a crew or not – he looks like a torturer to me, but he’s quite flexible… could be an Inquisitor in his own right! 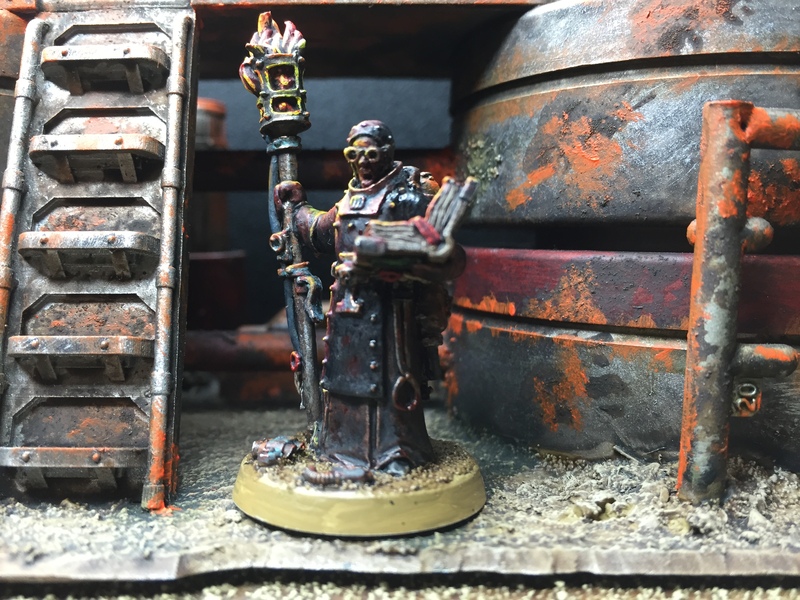 The OSL looks great and gives some great colors to the otherwise dark acolyte.